Shouts of joy as migrants reach Lesbos Jump to media player The Greek government and the UN refugee agency have brought in extra staff and ships to deal with thousands of stranded migrants on the island of Lesbos. 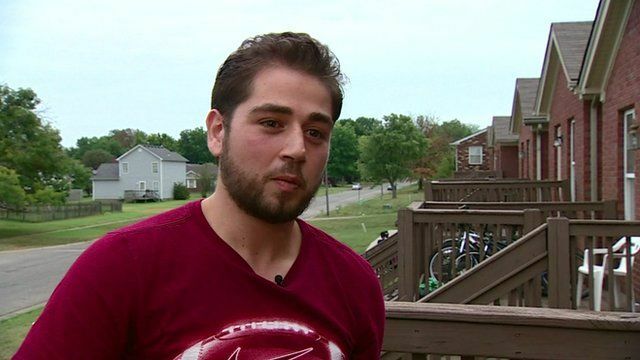 "We are not here because we are hungry," Mohamad, who fled the Syrian city of Homs and now lives outside Louisville, Kentucky, tells the BBC. "We are here because of war." President Barack Obama has called for the US to prepare to accept "at least" 10,000 Syrian refugees next year, according to a White House spokesman. But some Congressional opponents have said refugees programmes do not properly vet those applying for refugees status. Rajini Vaidyanathan reports from Kentucky. Filmed by Ron Skeans and produced by Sarah Holmes.